Real Madrid forward Gareth Bale says he is "ready for battle" as his team prepare to play arch rivals Barcelona in Saturday's El Clasico (17:15 GMT). 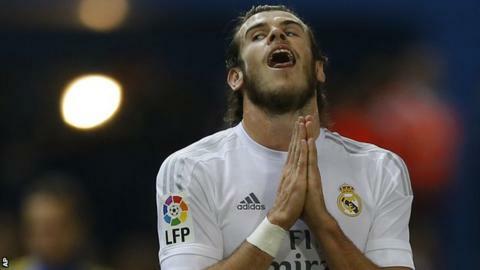 The Welshman, 26, suffered a recurrence of a calf injury in October and missed four matches before returning for the defeat by Sevilla on 8 November. "I've been out with injury for six weeks so I haven't had a chance to play much this season," he said. "But I'm feeling strong and fit for this game." Bale was absent from Wales' 3-2 defeat by Netherlands in a friendly last week as he continued his recovery. Real go into the game three points behind leaders Barcelona, who could have Argentine forward Lionel Messi available after recovering from a knee injury he suffered at the end of September. "We've been in good form so far this season, we've only lost one game and I still think there is some room for improvement," Bale told Real Madrid's website. "We could still be better, play better, and I'm hoping that, as the season goes on, our form continues to improve and that leads us to winning La Liga." Messi, who is the all-time leading scorer in El Clasico with 21 goals, is back in training and could return to Barcelona's attack along with Luis Suarez and Neymar. "Messi can change the game and he's done incredible things in previous Clasicos,'' said Suarez. "But it depends on the doctors and what they think is best for him. "He has looked good while training with us over the last few days but it's an injury that could take a sudden turn for the worse." Meanwhile, in response to the attacks in Paris which killed 130 people, Spanish authorities have declared the game a high-risk event and double the usual number of police will be at the Bernabeu. Nearly 1,500 private security agents will be working during the game, and at least 1,000 police officers.